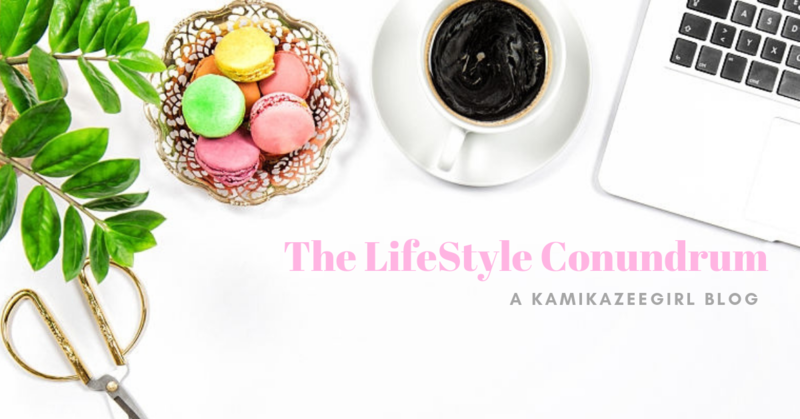 Watami Japanese Restaurant: What an experience! 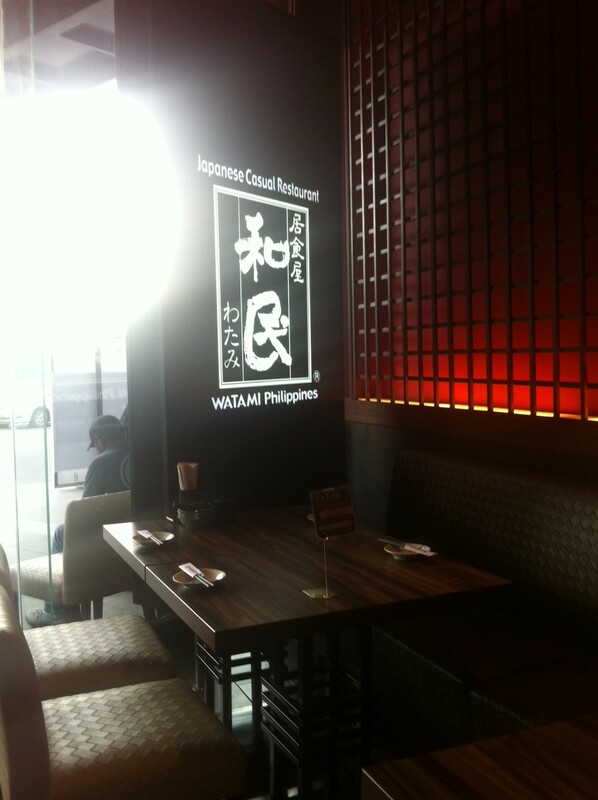 The newly-opened Watami Japanese Restaurant located at the ground floor of the newly-opened Glorietta 2 (near SM Makati) is one such restaurant. To celebrate a dear old friend from high school’s 33rd birthday, we scoured the latest restos in the area until we came across Watami. We liked the fact that the menu is positioned outside, for easy perusing — no need to wonder about the food being served inside. Upon entry, we were immediately ushered in to a corner table (no “sullen corner table nazi” here, thank God) and served a warm bowl of their house tea. We sipped the tea while perusing the menu and considered asking for refill — it was that good, warm and comforting, like a temporary respite to our already rumbling tummy. 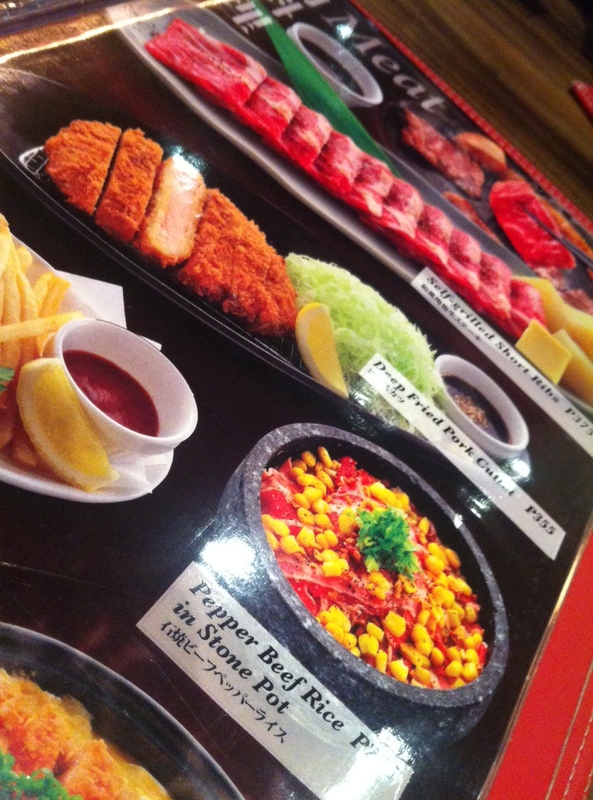 The bright, crisp pictures of the menu didn’t help silence my already rumbling tummy . This was one “creatively-executed” menu if I may so, speaking as someone who worked in advertising and breathed copy and lay outing for a good year and a half. The photos were inviting and jumps right at you. I chose the black pepper beef with rice in stone pot while my friend chose the soba. Here’s an interesting thing at Watami, when you order — the friendly servers will literary kneel beside you and talk to you in your level, eye-to-eye while you discuss your food choices. I never had the chance to ask them why they kneel, maybe it’s the Watami way of talking with customers. For someone like me who had craned her neck her whole life while talking to the servers, this is a nice refreshing change. It’s always nice to speak to someone on equal level. It’s a nice touch because for me, I can’t help but feel that it brings a feeling of trust and comfort between the customer and the servers. We didn’t have to wait for our food very long. 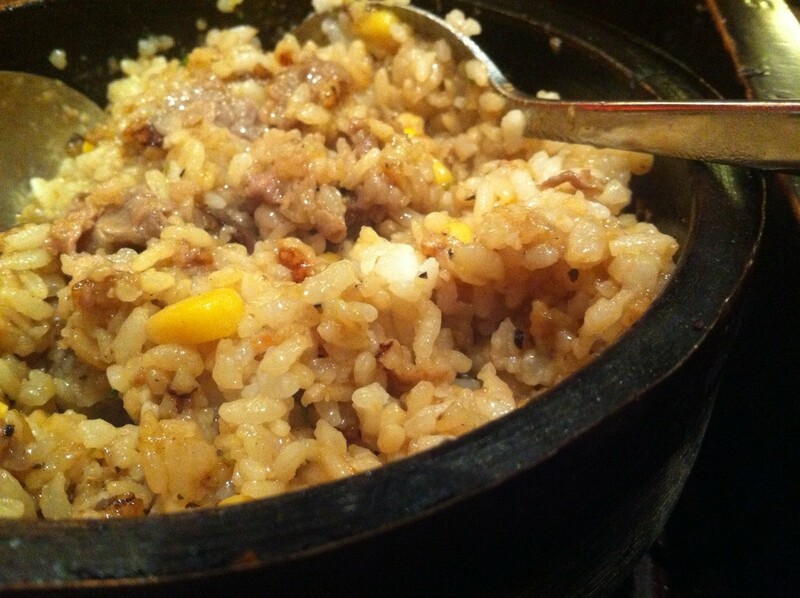 The black pepper beef with rice was sizzling hot when it arrived, the server mixed it in the table prior to presenting it to me. I deliberately let the rice burn a little, because I am one of the weird girls who loved picking on burnt rice. The corn was juicy while the beef was cooked just right. My friend’s soba was also good, and came with a tempura of shrimp and vegetables and the cold broth where you dip the noodles while eating. 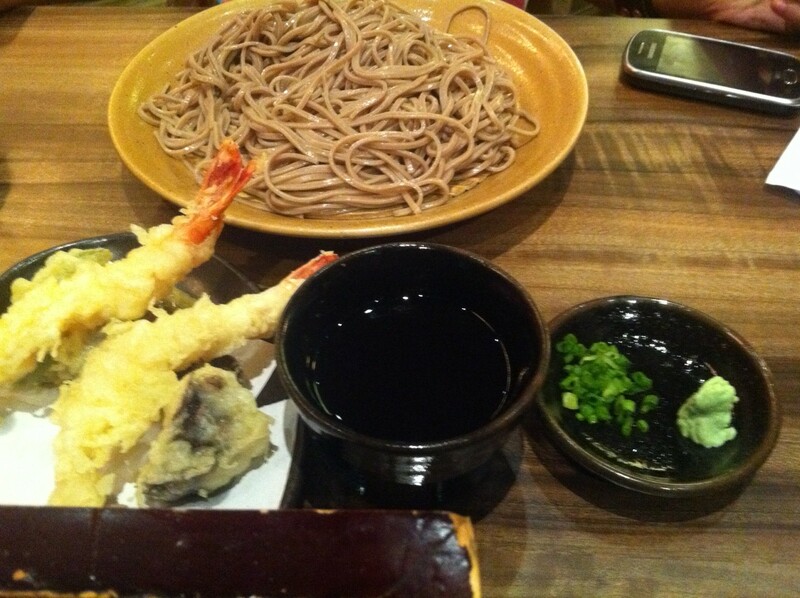 The serving for the soba was good enough for two, in fact, my friend ended up doggy bagging the rest. I quipped that it must be magic soba because she has been eating it for the last 30 minutes but it seemed not to diminish in size at all. Macha Parfait: single scoop of macha (green tea) ice cream, served with adzuki beans, whipped cream, yummy mochi balls, jelly, chocolate wafer stick and with crispy corn flakes in the bottom. 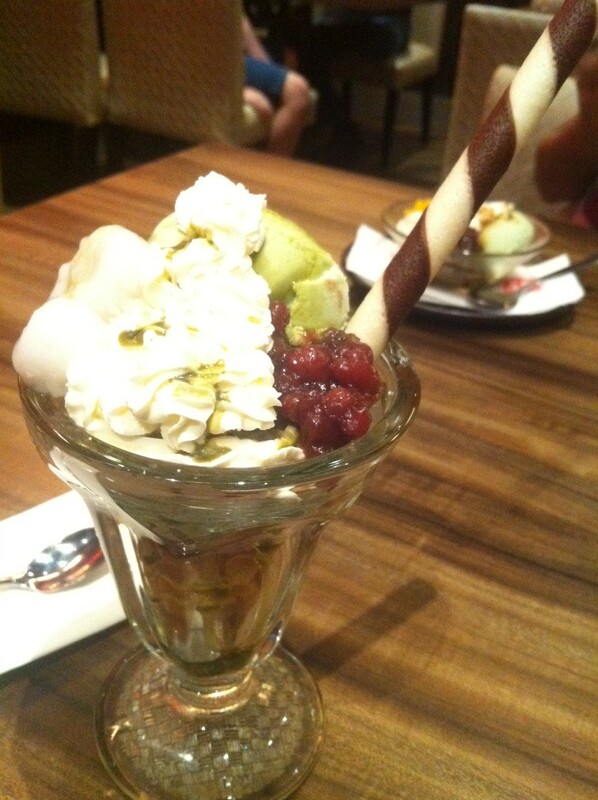 The parfait just had the right level of sweetness and Watami’s macha ice cream is one of the best I had. We enjoyed our visit to Watami and would definitely be back to share the food and the amazing ambience with friends and love ones. 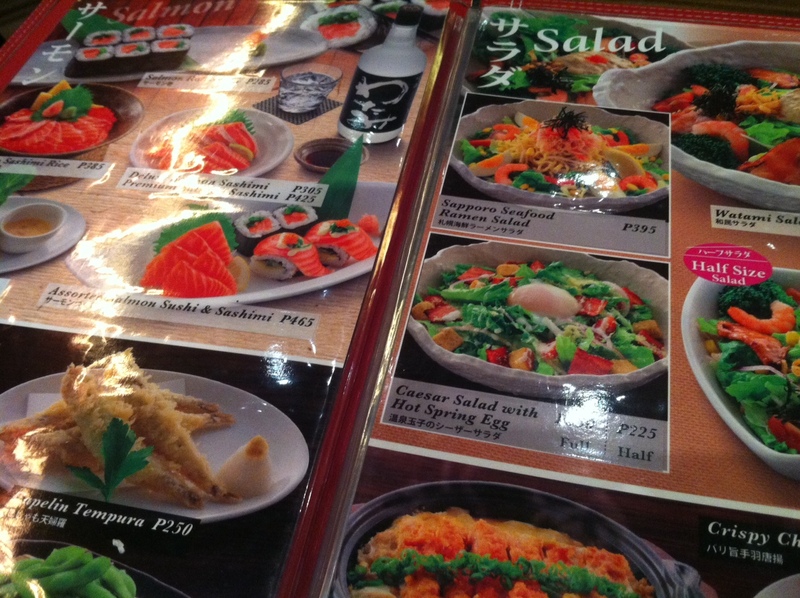 Finally, a Japanese restaurant I can always go back just to chill and indulge. DISCLOSURE: There is nothing to disclose. We personally paid for our meals. We have not been contacted with Watami or any of their representatives. Recommended budget per person: Depends on your order, but PHP700 per pax will get you a nice meal. Previous PostComfort food, non-existent customer serviceNext PostNever Lose Hope.